The first definitive demonstration of climate change upsetting the vital interdependent relationships between species has been revealed, thanks to a study led by the University of Sussex. Research led by Professor Michael Hutchings at the University of Sussex tracks how rising temperatures since the mid-17th century have wrecked a relationship, which relies on precision timing to succeed, between a rare orchid species and the Buffish Mining-bee which pollinates it. Professor Hutchings, Emeritus Professor in Ecology, said the climate is changing so rapidly that the early spider orchid cannot respond effectively, leaving this species, and probably many other plants with highly specialized pollination mechanisms, facing the threat of severe decline and possible extinction. Professor Hutchings said: "It is likely that many other species dependencies are also suffering from climate-induced changes to their life cycles. This study is, we believe, the best documentation we have as yet of such an effect and confirms with hard data the long-held concerns of ecologists. "While this is especially bad news for the early spider orchid, the devastating impact of climate change is in all likelihood harming the delicate interdependent relationships of many species." The early spider orchid achieves pollination by emitting a scent that imitates that of a female Buffish Mining-bee. The smell fools male bees into attempting to mate (pseudocopulation) with the flower. In doing so, the male bee dislodges pollen masses from the flower. These pollen masses are then transported to different flowers when the bee next attempts pseudocopulation. Pollination depends not only on male bees emerging before female bees and before flowering, but also, crucially, on the orchid flowering before female bees emerge. However, rising temperatures have led to male bee flight, female bee flight and flowering all occurring earlier in the calendar year, but the timings of the three events are not changing at the same rate. This is causing an increasing frequency of years in which the sequence of events needed for successful pollination (male bee emergence before orchid flowering before female bee emergence) does not occur. For every 1 °C rise in spring temperature, the peak flying dates of male and female bees occur 9.2 and 15.6 days earlier in the year but the orchids' peak flowering advances by just 6.4 days. The study shows that, since the mid-17th century, as recorded spring temperatures have gradually risen, the interval between male and female bees emerging from hibernation has decreased significantly. Most critically, however, higher spring temperatures now make female bees likely to achieve peak flying more than a week before peak orchid flowering date. Whereas peak flying date of female bees preceded peak orchid flowering in only 40% of the years between 1659 and 1710, this figure has risen to 80% in the years from 1961 to 2014. As female bees now take flight before the orchid flowers in almost every year, male bees will mate by preference with females rather than pseudocopulate with the orchid, simply because female bees are available as a better alternative when the orchid is flowering. Orchid pollination is therefore much less likely nowadays than when spring temperatures were lower, and it may fail completely in almost all years. 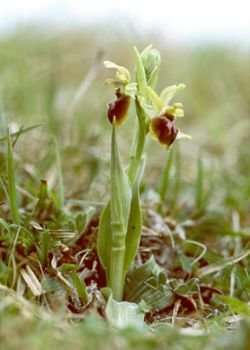 Worryingly, the research, carried out with the University of East Anglia and the University of Kent and published in the Botanical Journal of the Linnean Society, also shows that while the mean spring temperature in the UK has risen by about 1 °C in the 356-year period studied, the rate of warming, and its impact on bee flying and orchid flowering dates, is accelerating. Climate change, alongside loss of habitat, unsuitable grazing regimes, the orchid's already-inefficient pollination mechanism and its short life-span, has seen its range in the UK decline by at least 60% since 1930. But Professor Hutchings warns that unless the orchid undergoes rapid selection for earlier flowering following warm springs, it is likely that continued climate change will result in it always flowering after the emergence of female bees. He warns that a programme of hand pollination may be the only means to ensure the early spider-orchid remains a presence in the UK. He added: "Further studies are urgently required, on a wider range of species and in various ecological communities, to assess the potential for climate warming to cause disruption of vital life historical events where different species are dependent on each other. "As well as posing problems for plants that depend on pollinators being available on particular dates, climate change could threaten many other ecological interdependencies, including birds depending on caterpillars being available as food immediately after hatching and insects needing specific nectar sources." Professor Anthony Davy, Professor Emeritus at the University of East Anglia's School of Biological Sciences, said: "The vast number of historical records associated with specimens in the vaults of museums and herbaria is still a hugely under-exploited resource for studies of the effects of climate change." Researchers used a temperature record covering more than 350 years and data sets on the orchid and the bee dating back to the 19th century for the project. A 32-year field-based study of the demography of the orchid was the source of the original observations of flowering date advancing since the mid-1970s. 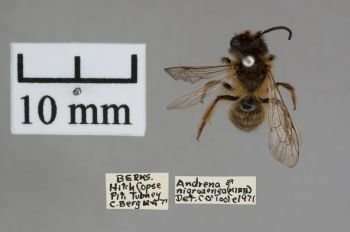 The team then used herbarium specimens stored at the Royal Botanic Gardens, Kew, and the British Museum, to calculate the peak flowering time going back to 1848 and bee specimens at the Natural History Museum and the Oxford University Museum of Natural History, to establish flight dates back to 1893. They then used the Central England Temperature (CET) record, which catalogues the average monthly temperature all the way back to 1659, to estimate what the likely dates for flight and flowering were in the past for a period of over three centuries.